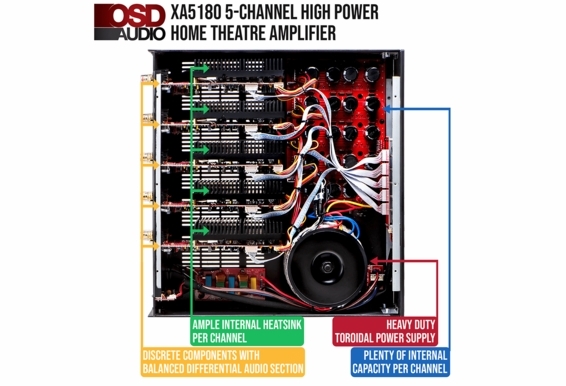 Designing and building an amazing surround sound system begins with the right separates and paramount to the mix is the right multi-channel amplifier. 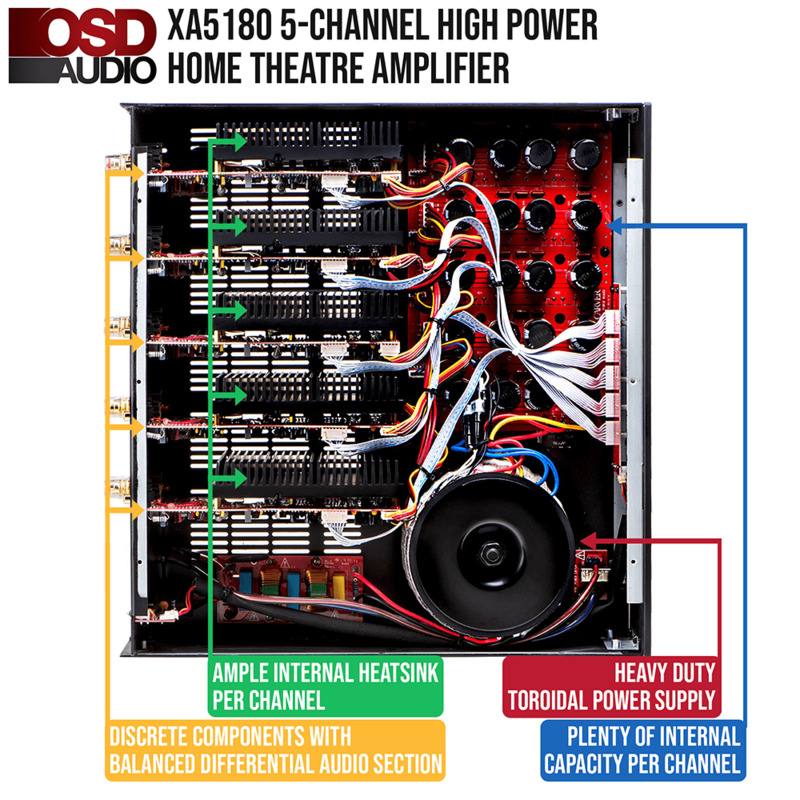 This amplifier is a 5-channel Class H amp that supplies 180W per channel of clean power, and when paired with great speakers like ours, you’ll hear music and movie soundtracks with exceptional detail, accuracy and warmth. The advanced circuitry, wide bandwidth, and low distortion capabilities of this amp allow listeners to hear spine-tingling sonic nuances, and this beefy amp can be matched with even power-hungry in-wall or freestanding loudspeakers. 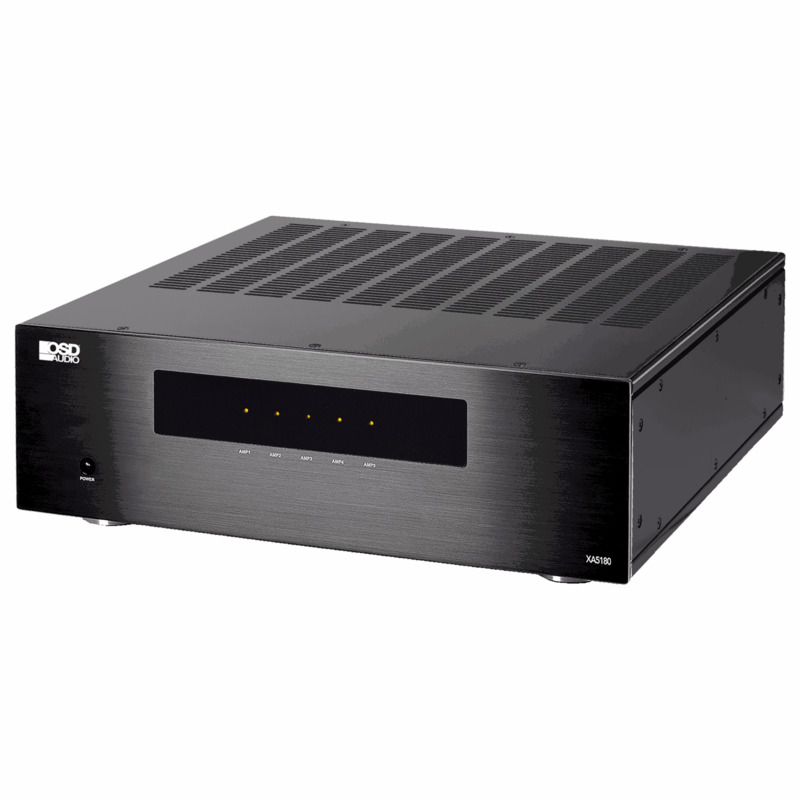 Designed with a high-output toroidal power supply and ample heat sinks to keep things cool, this amp has a clean, brushed metal finish and front panel status indicators that add a high-tech ambiance to any equipment rack. 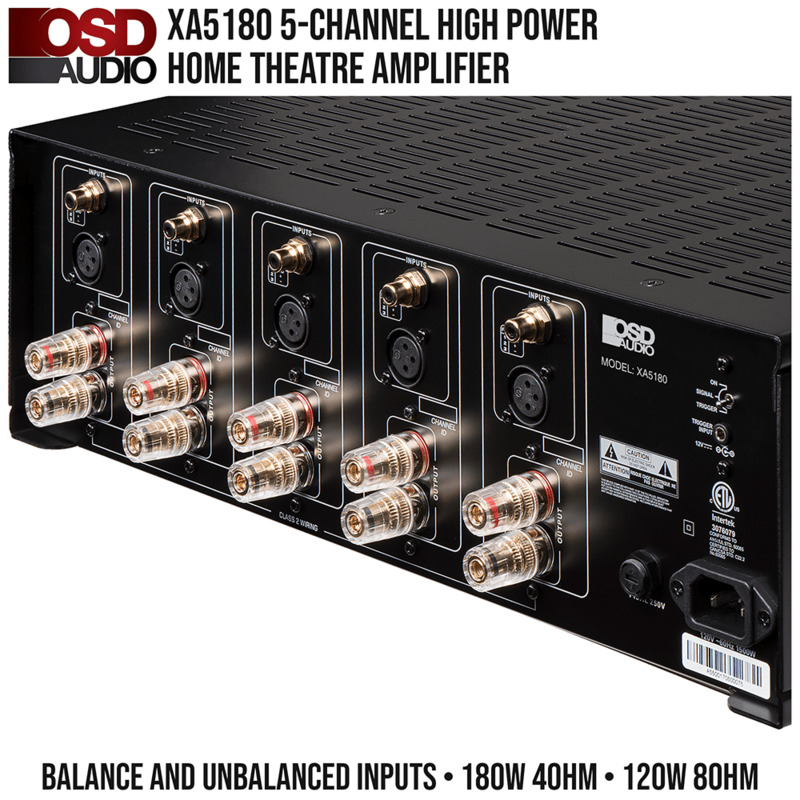 This high current home theater amplifier includes both balanced and unbalanced inputs for more flexible installation options and cable runs. 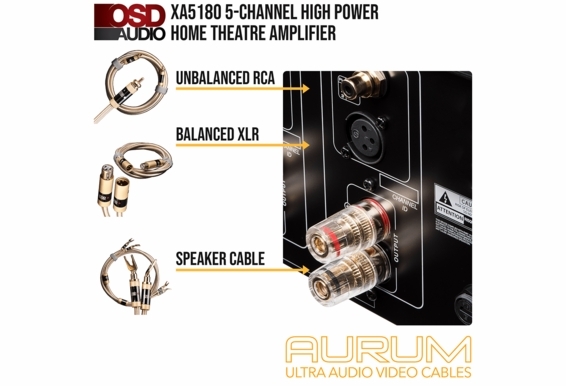 XLR inputs (balanced) include a ground wire which make it a good choice for long (up to 2000 ft) cable runs, while unbalanced (RCA) provide a more reliable signal on shorter runs. 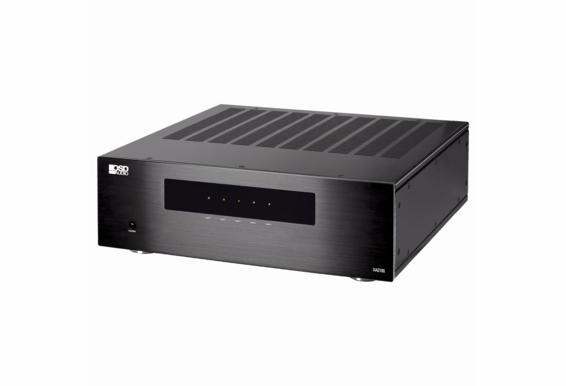 Our amplifier is a Class H amplifier that combines the benefits of Class A/B in a more efficient package. Class H amplifiers are a variation of Class A/B amps but include high voltage and low voltage rails to modulate power consumption. When power is running high, the amp switches to the high voltage rails. When the amp is running low, it switches to the low voltage rails. 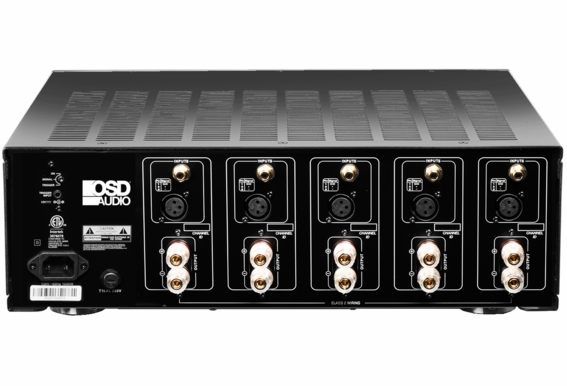 The result is more efficiency, cooler temperatures, and a reduction in power consumption while maintaining the warmth and accuracy of a true A/B amp without the "digital" drawbacks (like interference) of Class D amps. Dimensions (W x H x D): 17" x 6.0" x 16.75"
I have your xa 5180 amp and was wondering if I can run the center channel that is 8 ohms and the two front channels also 8 ohms then using the remaining two channels to drive 4 ohm subs? Is that possible or will that hurt the amp? Would you actually classify this as audiophile? Would you put it against Emotiva and Outlaw? I purchased one yesterday and it will be replacing emotiva but if it's not like what has been stated it's going back. It's just a little suspicious with the pricing and different wattage info in different places. Hello, Couple questions with explanation, short: Does this amplifier hiss with no source? Long version: I own a CROWN XLS 1002, I Had planned to use it in a HTR setup in the future, Currently though I'm using it as my front left+right in a 5.1 setup from my receivers ins/pre-outs. The problem is I hear a HISS at minimum volume and increased volume. The Hiss is apparent at any level with no source just speakers and power cable plugged in. It's been driving me crazy in a desk setup. I've read on forums that people just ignore it or don't hear it in a HTR setup because they're sitting further back. I'm not sure if it's from some SNR / Signal to noise ratio thing, I'm still trying to understand this SNR spec(maybe you can explain this too?).. Also I read that higher sensitivity speakers will output the Noise Floor sound / HISS more. My speakers I Think are on the lower end of sensitivity 88dB.. I thought it would work out, Apparently not. - Please let me know about all this. and the XA5180, if this one has hiss. I know one is a pro amp one is not, I Still need help. I have a Denon avr x4300 receiver and an Audiosource 2 channel amp in a 7.2.4 set up. The Denon outputs 125 watts per channel 2 channel driven. If I do the math, if I run 9 channels of the receiver ( which I am doing ), its probably sending 60 watts per channel, maybe a little more. My speakers being Klipsch which are very sensitive, act very well wit this amount of power. But I don't know if I am getting the best sound that can come from them. 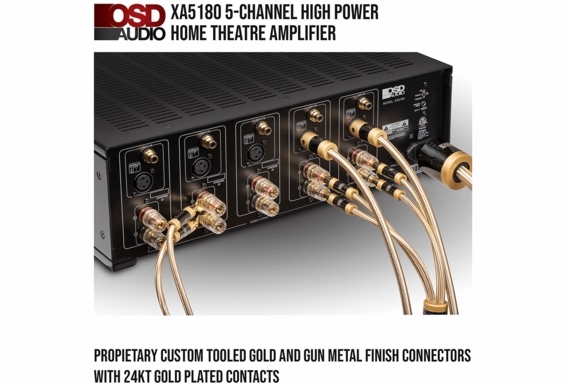 How much of a difference will this amp make as far as more volume and cleaner more clear sound ( if at all possible)? 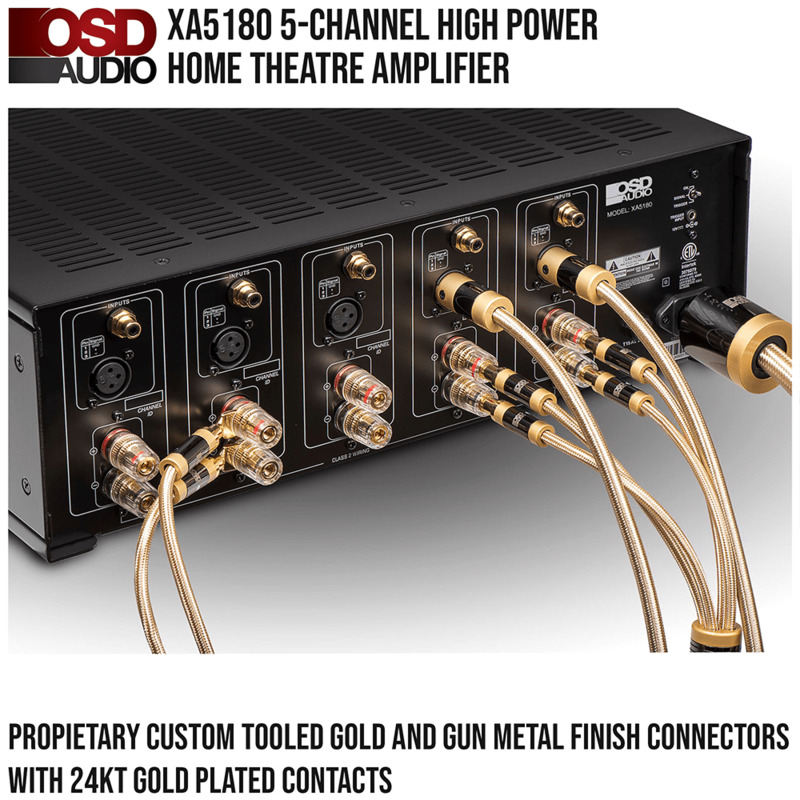 Is a trigger cable included with the XA5180 amplifier? If so, how long is it? Thanks. how much does the amp weigh on amazon it says 25 pounds on this website it says 54 pounds which one is correct. 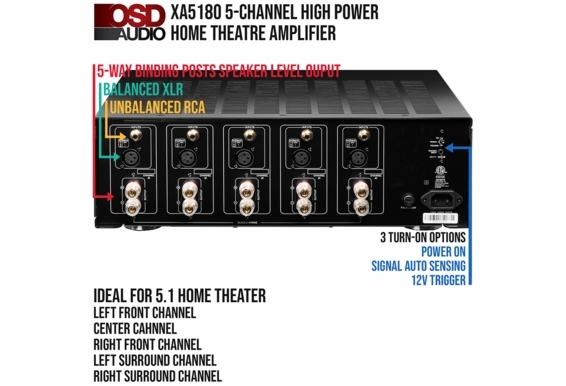 Question about part of your answer(from before).. if I use RCA to XLR, do I still benefit from the Balanced XLR "signal is increased 6 to 10 dB"(and virtually no noise)" example, denon receiver pre-outs(RCA) RCA to XLR then to the amp. -Thanks in advance for answering this. 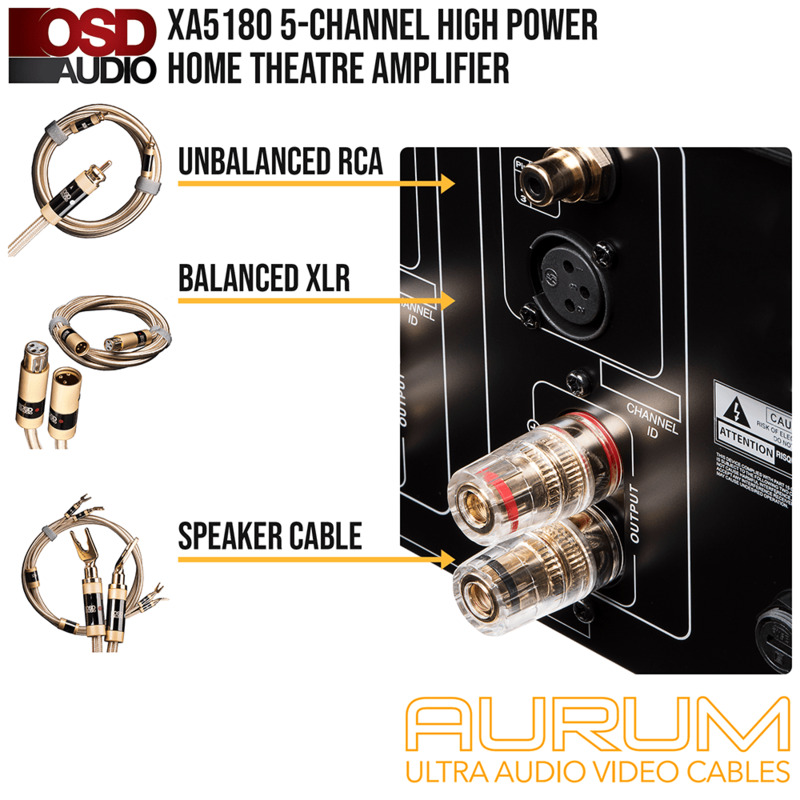 How does the XA5180 switches between unbalanced RCA and balanced XLR inputs? I do not see any . What is the wattage at 8 ohms all channels running at the same time? How would this compare to the Outlaw 5000 and the Emotiva X Bas5? Is this Class A/B or Class D amp? 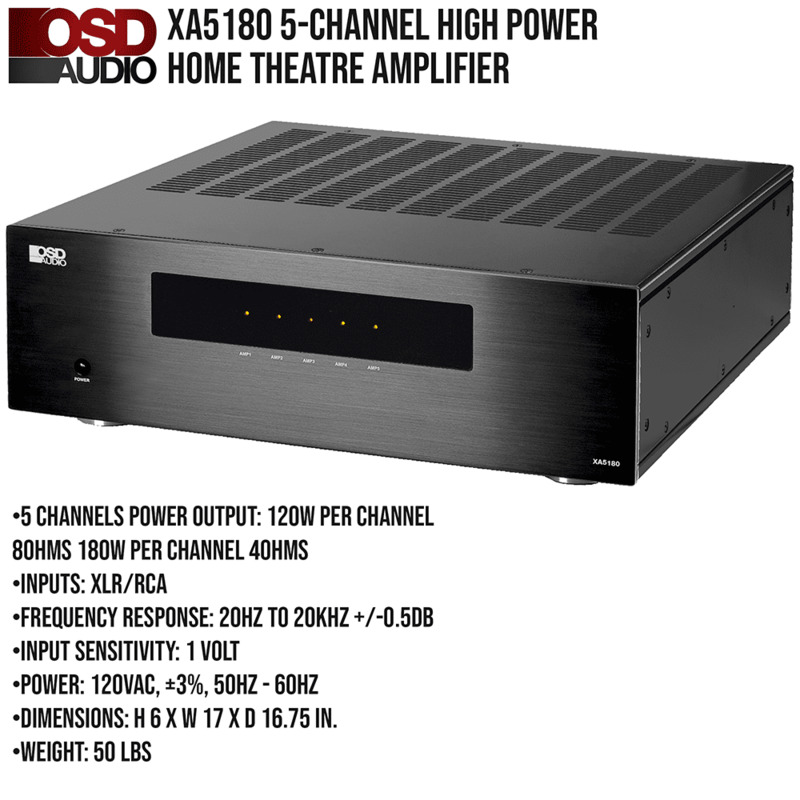 Is 150W rating (8ohm) while all channels driven or one channel? Do you mind posting a picture of interior? 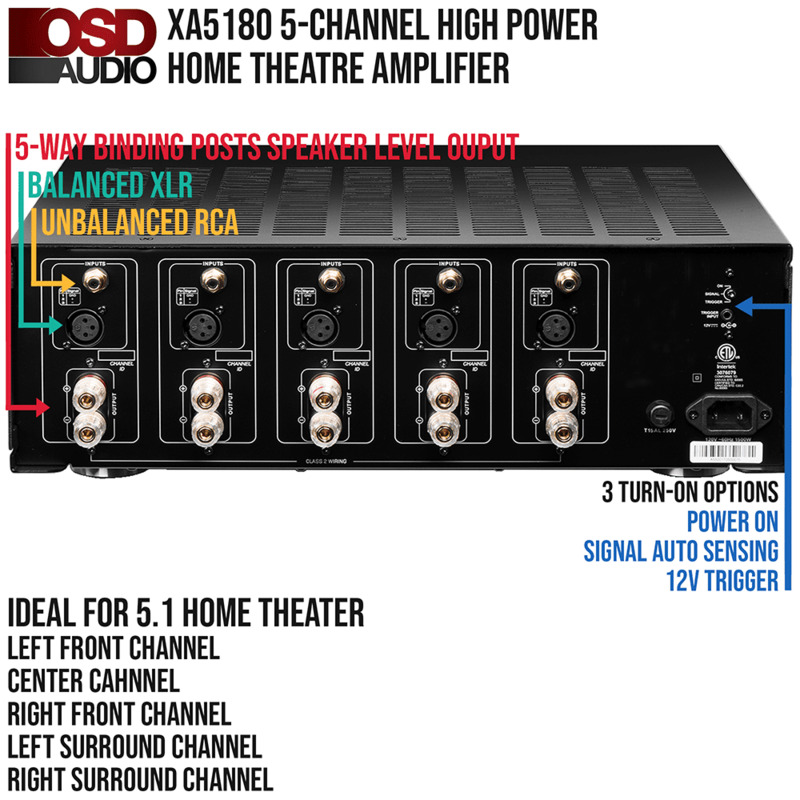 is the power output 150 w all channels driven? 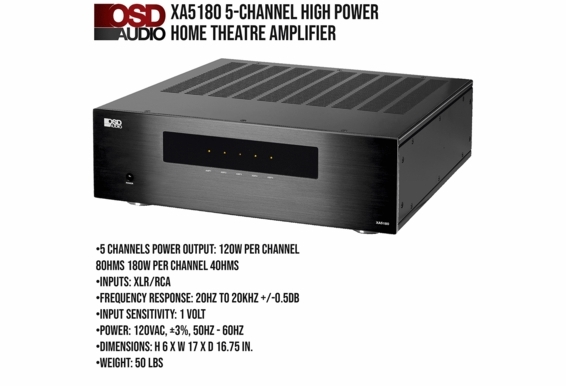 What is the Distortion rating on this amp at 8 ohms and at 4 Ohms driven? Where is the amp. manufactured? Do you ship to Barbados, West Indies? 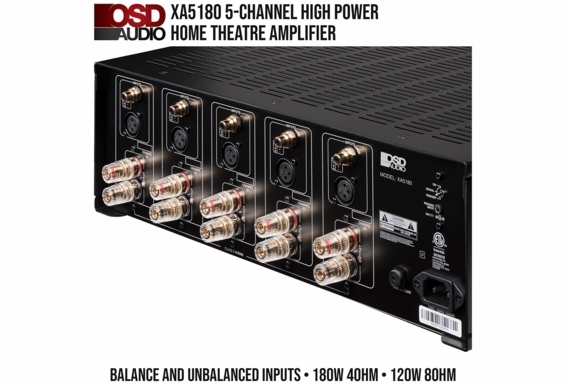 Can you connect this to a 5.1 receiver or 2 channel receiver? If you could, how do you do it? Thanks, Ed.